It is my firm belief that red wine sauces always give a feeling of elegance and richness to a dish. And what a better way to dress up a Weight Watchers chicken recipe than with a hearty red wine sauce and mushrooms sautéed with garlic and shallots? 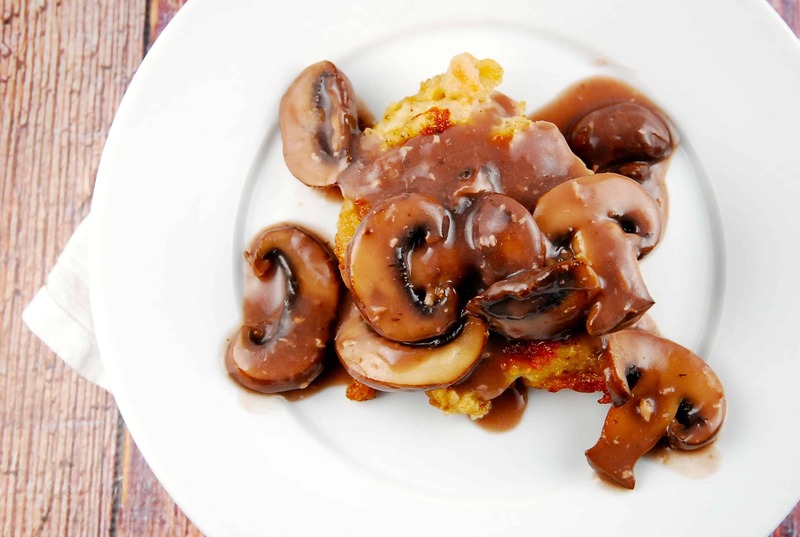 In this Chicken and Mushrooms with Red Wine Sauce Recipe, I lightly breaded the chicken, pan fried it, and then topped it with mushrooms and a bold and lovely sauce. Easy, yet decadent, and just 7 Points per serving! One suggestion I want to make though – try flattening the chicken fillets with a mallet, before cooking. I did not do this, and my chicken was quite thick, thus taking a bit longer to cook, curled up a bit while cooking, and actually ended up looking quite small on the plate (the thickness is hidden under all that mushroom and wine sauce!). Sometimes having a nice large piece of chicken on your plate, can convince your eyes that you are eating more than you actually are, thus helping you to feel satisfied. Just my 2 cents. I recommend pairing this with mashed or roasted potatoes, and a light salad. It feels like the perfect warm and comforting that will be a wonderfully satisfying meal on a cold winter’s day. Elegant, moist, and mouthwateringly flavorful, this Weight Watchers Chicken Recipe is an ideal dinner. Serve over mashed potatoes for a very filling and satisfying dish that won’t break your Points bank. Heat oil in a large nonstick skillet on medium high heat. Season chicken fillets on both sides with salt, pepper, paprika and thyme. Place flour (reserving 2 tbsp) in a shallow bowl, and dredge chicken fillets until evenly coated. Sauté chicken for about 4 minutes on each side, or until chicken is cooked through and no longer pink inside. Remove chicken and set aside. Add butter to pan, leaving heat at medium high. Once butter has melted, add in garlic and shallots, and sauté until fragrant and until shallots begin to turn translucent, about 2 minutes. Add in sliced mushrooms, and cook, while gently stirring around for another 2 minutes. Stir in the red wine, and let simmer, stirring occasionally, until wine has reduced by half. Add in the reserved tablespoons of flour, and turn heat to medium. Simmer, while stirring frequently until sauce has thickened to a stew like consistency. Plate each fillet of chicken and top with 1/4 of the mushrooms and sauce. Thanks so much for these recipes! I tried the chicken and mushroom with red wine sauce and although it was very filling and the batter was lovely, the red wine sauce just didn’t do it for me. I always cook with wine I would drink so I don’t think it was a “wine quality” issue. I would love to make this in the future but I wonder if you can suggest an alternate liquid for the sauce? You can sub out the wine with chicken broth. It’s a more mild flavor, but still delicious! Really didn’t like this recipe. It might have been more tasty,with white wine and less thyme. I am always looking for weight watchers recipes……will try others. Is there no way to print out this recipe; I cannot seem to find a print icon anywhere? Just wondering if you could add a print button to your recipes!